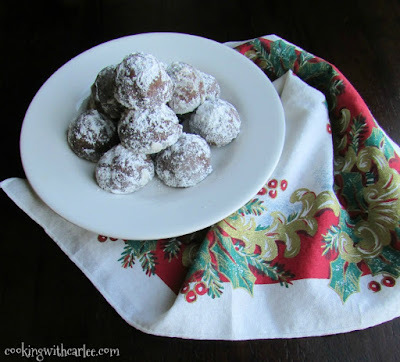 These festive cookies feature a dark chocolate snowball cookie dough wrapped around a maraschino cherry for a fun Christmas cookie unlike any other! They aren't too sweet and just the right size for a couple bites and a smile! It is hard to believe we are already on day 11 of our 12 days of cookies. I have found so many great ideas along the way. My list of new cookies to try is growing every day. I will still be baking Christmas cookies well into the new year! Have you had a chance to check out any of the other cookies yet? There is something for everyone! I know I already shared a chocolate covered cherry cookie, but this idea popped into my head and I just couldn't let it go. 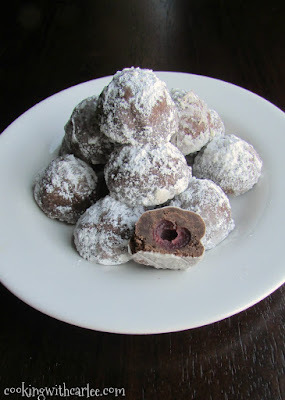 I took a basic melt in your mouth snowball recipe and made it chocolate. Then I wrapped it around a cherry. Let me tell you, it worked every bit as well as I imagined. Mine had a dark, not to sweet chocolate shell. You could easily dial back the cocoa a bit and replace it with the same amount of flour if you wanted a milder chocolate cookie. No matter what, they are sure to be enjoyed! Drain the jar of cherries and spread the cherries out the dry. They dryer they are, the easier it is to work the dough around them. Patting them down with a paper towel is encouraged. Cream the butter until it is smooth and fluffy. Beat in the powdered sugar. Stir together the flour and cocoa powder and then mix into the butter mixture. Work about a Tablespoon of dough around cherry to form a ball. Place about an inch apart on a baking sheet and bake for 18-20 minutes. 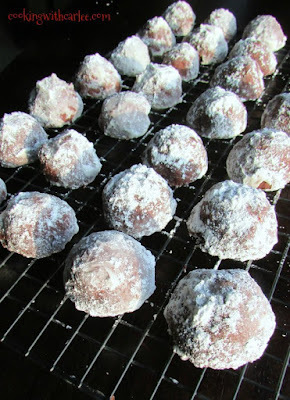 Allow to cool on the cookie sheet for about 5 minutes, then roll in powdered sugar. Cool completely on a wire rack. My youngest will flip over these cookies. He loves all things cherry! Ooooooo so gonna make these!! Great idea :) Ty so much for the recipe Carlee. Hope you had a great weekend! Hooray for all things cherry!! You definitely have me inspired! 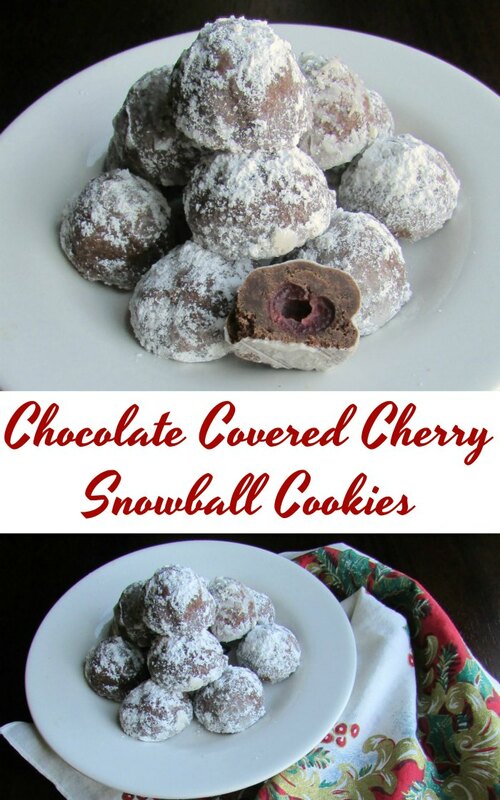 We have a foot of snow on the ground and I miss throwing snowballs so I will just eat some of these yummy cherry snowball cookies you made while your and Jax play in the snow, lol. Happy festive week ahead friend!! I think one snow a year would be plenty... though Jax would not agree! I'd much rather eat my snowballs too! I have made all of these cookies for this event. 12 days of cookies and all my husband can talk about is when I am going to make "cherry balls" very similar to this but not chocolate. Maybe I will try this version and see if it satisfies him. Ha! Now I am nervous about what qualifies as a "real" Christmas cookie. I hope he loves them if you try them! Mmmmm That's the one candy I look forward to during the holidays. Chocolate covered cherries! These look delicious. Oh my goodness I can't wait to have one of these awesome snowballs, YUM! Hope you have a fantastic week and thanks so much for sharing with us at Full Plate Thursday. They would be perfect for that too! Have a merry Christmas! These sound so good! My grandson would love them (he loves the cherries). Thanks for sharing at Funtastic Friday. There is something about those cherries! Thanks! I know you think you just posted a great recipe, but what you posted has brought tears to my eyes. memories of sweet friend who made these every Christmas. He was famous for them. He let us too soon from brain cancer, and his daughters cherish this recipe as they carry on this tradition. I can't quite bring myself to publish a post on this recipe on my own blog,as it doesn't feel quite like it's mine to share. So I loved running into it on another sweet friends! Thanks for sharing memories on our Celebrate365 Cookie Exchange! website and reading very innformative content at this time.